“Await Further Instructions” (2018). Cast: Sam Gittins, Neerja Naik, Grant Masters, Abigail Cruttenden, Holly Weston, Kris Saddler, David Bradley. Director: Johnny Kevorkian. Screenplay: Gavin Williams. Web site. Facebook Page. Christmas is supposed to be a festive time of year, full of good times and good cheer, especially in the company of loved ones. As many of us know, however, that’s not always the case, especially when we spend time with family members. So it is with the Milgrams, who are getting together as a group for the first time in years – not that everyone wants that, though. The family member dreading the occasion the most is Nick (Sam Gittins), a twenty-something young man who’s seeing his relatives for the first time after a prolonged estrangement. He’s bringing his Indian girlfriend, Annji (Neerja Naik), with him in hopes that her presence will make the experience more bearable. However, given the less-than-veiled prejudicial attitudes of Nick’s other family members, such as his insincerely effusive mum, Beth (Abigail Cruttenden), his dimwitted pregnant sister, Kate (Holly Weston), and his perpetually surly granddad (David Bailey), perhaps asking Annji to join him wasn’t the best idea. Then there’s Nick’s dad, Tony (Grant Masters), a self-important, hardline Christian fundamentalist with a Napoleonic complex, an overcompensating trait designed to conceal his nagging insecurity at never having made more of himself (a fact that granddad continually goads him about). Rounding out the festivities is Kate’s husband, Scott (Kris Saddler), an often-clueless sort who seems to have ample trouble thinking for himself. And so, set against this backdrop, the fun and games begin. But, before long, the Milgram family finds itself in the midst of a holiday get-together they never would have imagined. 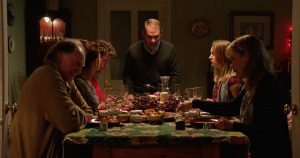 The Milgram family (from left, David Bradley, Neerja Naik, Kris Saddler, Grant Masters, Holly Weston, Abigail Cruttenden) assembles for Christmas dinner amidst trying circumstances in the chilling new smart horror film, “Await Further Instructions.” Photo courtesy of Goldfinch Studios and Shudder Films. As festivities ramp up, the family members witness a series of troubling TV news reports about power outages, suspected terrorist attacks and other strange phenomena. But that’s nothing compared to what they wake up to on Christmas morning. The Milgrams find their home completely encased in a durable black, strand-like substance. They have no view of the outside world through windows or doors. And though they still have electricity, they don’t have phone, cable TV or internet service. Their only connection to what’s beyond their walls is a cryptic message on their TV screen, presumably sent on a special government emergency frequency, that reads “Stay indoors. Await further instructions.” So now what? In no time, those further instructions begin coming through, each one more ominous than what preceded it. Without giving too much away, those messages ask the family members to perform progressively more demanding tasks, some of which prompt them into taking drastic actions and questioning the home’s fellow inhabitants. Paranoia quickly sets in, and danger comes as much from the inside as it apparently does from the outside. Such circumstances raise the question, “Can they survive the holidays?” That’s something many of us do already, but this time the stakes are much higher. As the story plays out, the Milgrams are forced into dealing with some heady questions: Is it indeed acceptable to question authority, be it from government, organized religion, the medical community and even the media? When is it permissible to cast aside the dictates of such sources and think for oneself? What does it mean to question one’s peers, including those we think we know and love? How do we keep prejudices from getting the better of us and dividing us? And what do we do if we work up the nerve to pursue our own beliefs? Even though these notions are presented in a horror film context, it’s easy to see how these considerations are just as applicable to the conditions of everyday life that we all face today – and potentially just as troubling. 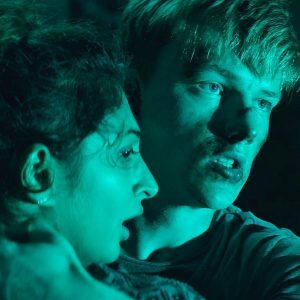 Nick Milgram (Sam Gittins, right) and his girlfriend, Annji (Neerja Naik, left), hold on for dear life in director Johnny Kevorkian’s excellent new smart horror film, “Await Further Instructions.” Photo courtesy of Goldfinch Studios and Shudder Films. The film also raises numerous questions about technology and the media. How much faith should we place in them? When do we cross a line where we allow them to control us rather than the other way around? And can we always trust what these devices and outlets are telling us? While these ideas are presented largely symbolically, they’re nevertheless easy to spot and definitely represent concerns that we must all contend with – perhaps more than we feel comfortable with, too. Of course, the big question here is why is this all happening? How did the Milgrams find themselves in these circumstances? For better or worse, they’re the product of the conscious creation process, the means by which we manifest the reality we experience through the power of our thoughts, beliefs and intents. And, as much as the characters here would likely want to proclaim themselves victims, that’s something that deserves a closer look. In our technologically advanced world, we no doubt want to proudly claim credit for the many tremendous accomplishments we’ve achieved in this area. Who would have thought, even as recently as 15 years ago, for example, that we would have been able to create what we have. But, in manifesting those mechanical marvels, we must be prepared to accept the fact that we’ve created everything that goes along with them, benefits and downsides alike. The same is true of our institutions, be they in government, religion, medicine and the media. The beliefs and intents that we collectively employed to produce these items and conventions brought us all of the applications associated with them, including those that may unfortunately trap us through the works that spring forth from our own hands – and minds. So, when we witness these things starting to go haywire by becoming more intrusive, more demanding and more worrisome, we’re just as much behind those potentially negative developments as we are behind all of the positive functions they afford us, even if most of us dislike them or are unaware of these occurrences as such. On some level, we’ve allowed their existence, and, when they come into full materialization, we may face consequences that are dire and unanticipated, despite being backed by metaphysical building blocks that brought them into being. Indeed, if we try to protest these developments and claim no responsibility for them, we nevertheless must avow our involvement in these matters, regardless of how unpleasant they are and how much we try to deny our participation. This begs the question, then, how do we get ourselves out of such circumstances? Well, there are a number of ways to counteract these conditions. For starters, we could do like Nick and Annji and deliberately think for ourselves, making our thoughts known, even if they go against convention and what authoritarian sources have to say. We could try pushing the limits of our beliefs and intents by infusing them with qualities that purposely screen out the undesired traits. We could even try conceiving of alternate scenarios in which we devise manifestations that counter those that are causing trouble in the first place. The bottom line here is that we’re not permanently saddled with these circumstances unless we choose to be. And that’s the challenge faced by the characters in this film and in the real world at large today. If we purposely allow ourselves to tune out to the point where these influences can have their way in shaping our existence, then we’re surely doomed. We must consciously choose for our reality to materialize otherwise. If we don’t, we may well face a future not unlike what the Milgrams experience. Is that something we really want? If not, we’d better heed the cautionary tale served up by this film – before it’s too late. It may take a little effort to find “Await Further Instructions” at present. 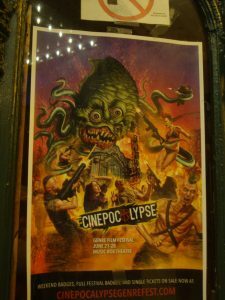 I screened its world premiere at the Cinepocalypse Film Festival at Chicago’s Music Box Theater, and, for the near future, it’s slated to play only at other such events. However, according to the filmmakers in a post-screening Q&A session, distribution agreements appear to be in the works, with a possible release date of this fall. When the film receives the green light, I strongly recommend that interested viewers go see it. It’s that good. 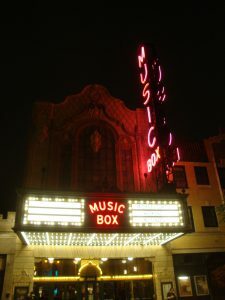 Chicago’s Music Box Theater, home of the Cinepocalypse Film Festival, which recently featured the world premiere of the new smart horror film, “Await Further Instructions.” Photos by Brent Marchant. Director Johnny Kevorkian and screenwriter Gavin Williams have put together an excellent production, yet another fine offering in the smart horror genre. 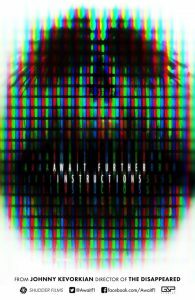 “Await Further Instructions” combines poignant social commentary, ample humor and plenty of suspense, all without going over the top and descending into an endless gore fest, a combination that made “Get Out” (2017) such a huge hit. There’s much to ponder, a lot to laugh at and chills aplenty in this riveting, richly layered British offering, with influences from such diverse sources as Japanese cinema, classic horror films, Alfred Hitchcock and even TV’s “Twilight Zone” (particularly classic episodes like “The Shelter” and “The Monsters Are Due on Maple Street”). It packs quite a punch, one that will leave viewers with much to discuss when they walk out of the theater. In an age where many of us may feel like we’re losing ourselves, it’s important that we have films like “Await Further Instructions” to remind us of our humanity – and the need to hold on to it at all costs. Should we ever lose sight of that – and there’s a frighteningly increased risk of that these days – we could find ourselves in perilous circumstances from which there would be no recovery. Consider ourselves warned.